1. Running - not from or to anything particular -- in one of those old-fashioned driving outfits: leather duster, snap brim cap, goggles & oversized gloves. 2. At a party with a bunch of my friends. Telling them how much I appreciated their friendship. 3. 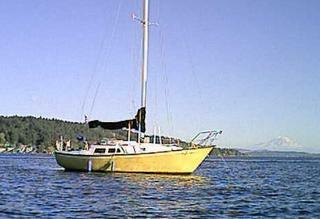 Escaping from pirates on a jury-rigged catamaran, as arrows & bullets whizzed past my head. 4. Drowning on my own boat right next to the pier, due to a faulty D-ring that kept me secured to one of the jack lines in the cockpit (normally a very sensible safety precaution). 5. Saying a tearfull goodbye to my grandfather (who didn't look a bit like either of my late grandfathers) in some sort of departure lounge. 6. Rescuing a bunch of people from a burning building. Now, remembering one or two dreams a night may be the norm, but six? That's got to be some sort of personal record. Perhaps my recollections were enhanced by the fact that I woke up immediately after each dream, thus enabling the conscious side of my brain to make note of some of the details for later reference. I'm sure a Freudian analyst would have a field day interpreting all this, but I'll just chalk it up to the fact that it is also a New Moon, as well as Feile na Marbh, the second day of the Feast of Samhuinn, the celebration of the Celtic New Year, when, according to Druidic mythology the great shield of Scathach, the legendary warrior-princess, was lowered from the sky, causing a rift between the natural and supernatural worlds to open, and thus allowing the living and the dead to come together to welcome the end of impending darkness and the gradual return of light and warmth. Of course, I also can't discount the possibility that the stir fried tofu and the meatball soup I had for dinner last night just didn't agree with me. But regardless, if you're of a mind, give a sprig from the mistletoe to some deserving soul. Leave the unharvested fruit for the fairie folk to eat. Douse the hearth fire, and set out the food and drink. We'll be by shortly with a burning ember from the bone-fire to rekindle the flame for another year. Oh, and Happy Birthday, Lyle Lovett.